On Monday, I went from retired to semi-retired. Signed an agreement and received a statement of work to do some consulting. And I went to work yesterday! I think I will like this engagement as it uses my knowledge and work experiences. So my retirement lasted 106 days–my hubby asked that I not do anything for 60 days and I made that. Some may wonder why do I want to work if I don’t have to work for the money?! The main reason is I really want something to occupy me though I have found a lot of things to do in the last 100+ days, like gardening, cleaning, organizing, buying a beach condo, and traveling. I haven’t felt like my mind was engaged. Do you know how you feel when you are mentally challenged on some task or project? I like that feeling, maybe there is some adrenaline rush or sense of satisfaction? Since retired, I have worked soduku, played words with friends, read a TON of books (not really as most are on my iPad! ), prepared budgets, organized documents for the beach condo, and still I have found myself just a teensy bit–here is that dreaded word, BORED. Did you hate when your child would come up and say, MOM, I’m BORED! My son soon learned to not say that to me as I always found him something to do and he probably didn’t like it much! A good lesson I learned from my mom. 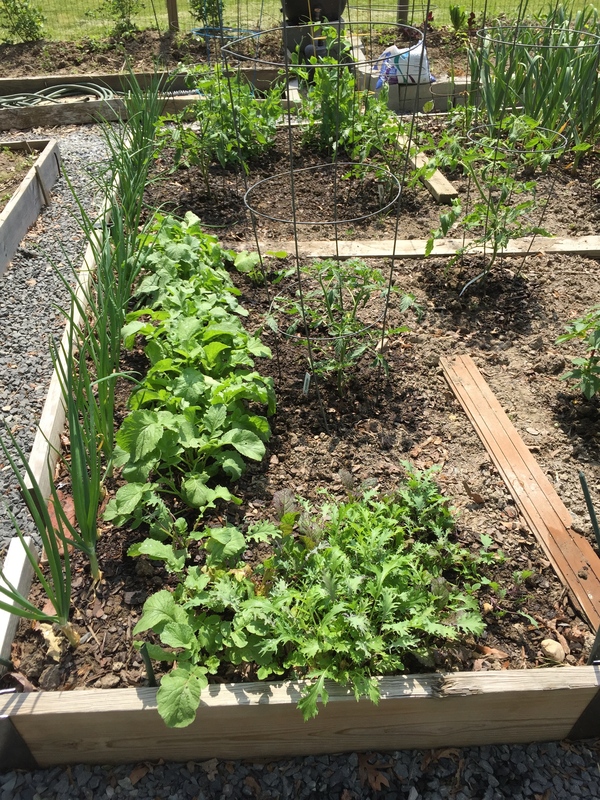 Anyway, here are a couple of photos from the community garden. 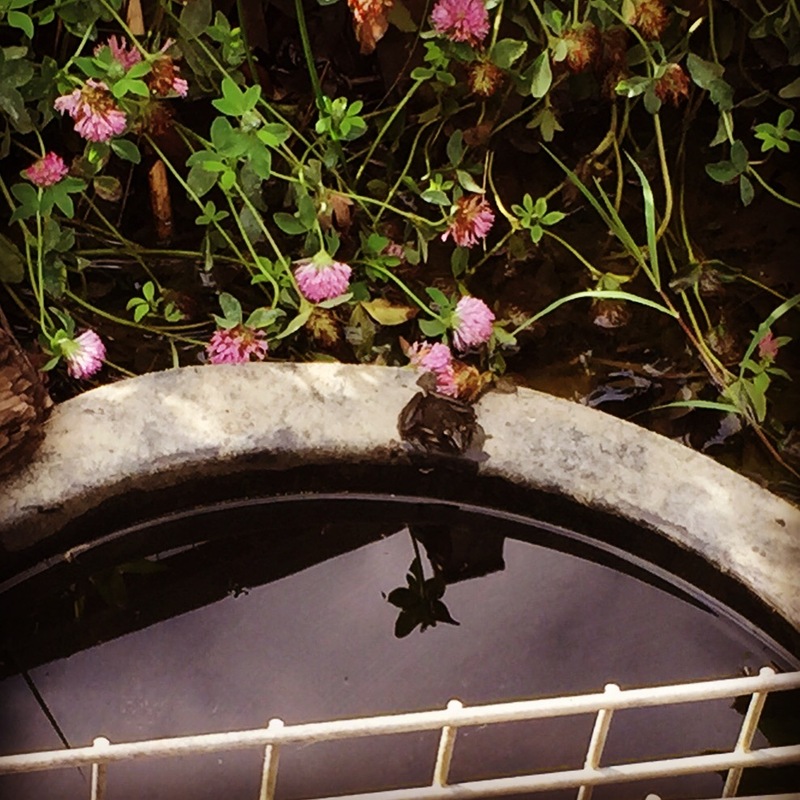 A little frog on the catch basin, and this after one of the gardeners insinuated that I used PREEN on my garden because it was weed-free and of course the PREEN killed all of our garden frogs! I think the snake(s) ate some of the frogs, as the hunting was pretty easy. 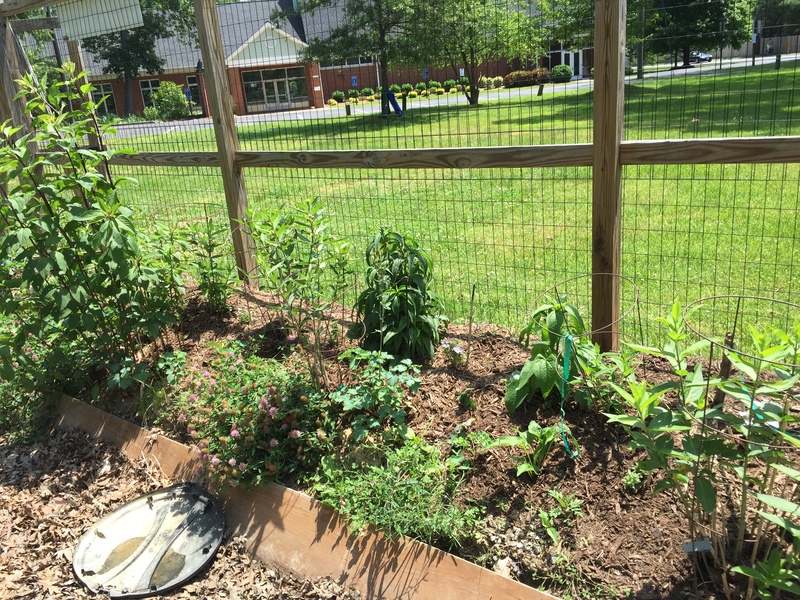 And we have one water barrel full of tadpoles… The second photo is the butterfly garden with jo-pye weed, milkweed, clover, etc. The milkweed started blooming so am on the lookout for the monarchs! Summer keeps teasing us, one day I think she is upon us and the next day, here comes a cool, rainy, springy day. The rain helps the yard and garden, we had a mini-drought going on up until last weekend. 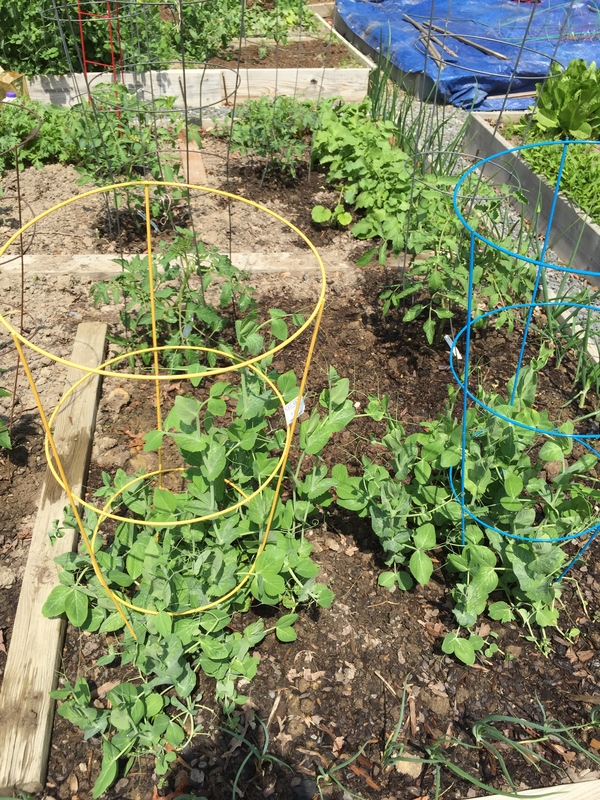 In my plot at the community garden, snap peas did not like the hot weather, and the radishes bolted-forming seed heads and not the radish. Practicing patience is not my long suit, I have resisted tearing them up and planting something else. I pick lettuce, kale, arugula about every other day. Planted tomatillos, tomatoes, eggplants, and lots of peppers-anchos, habaneros, jalapeño, green bell, and hot. The garlic should be ready to pull in another couple of weeks. Had to buy garlic for the first time since last June as I finally used up the last bulb. And to add excitement to my gardening routine, this little guy surprised me on the way to the compost pile. I think its a ribbon snake, about 2 ft in length. 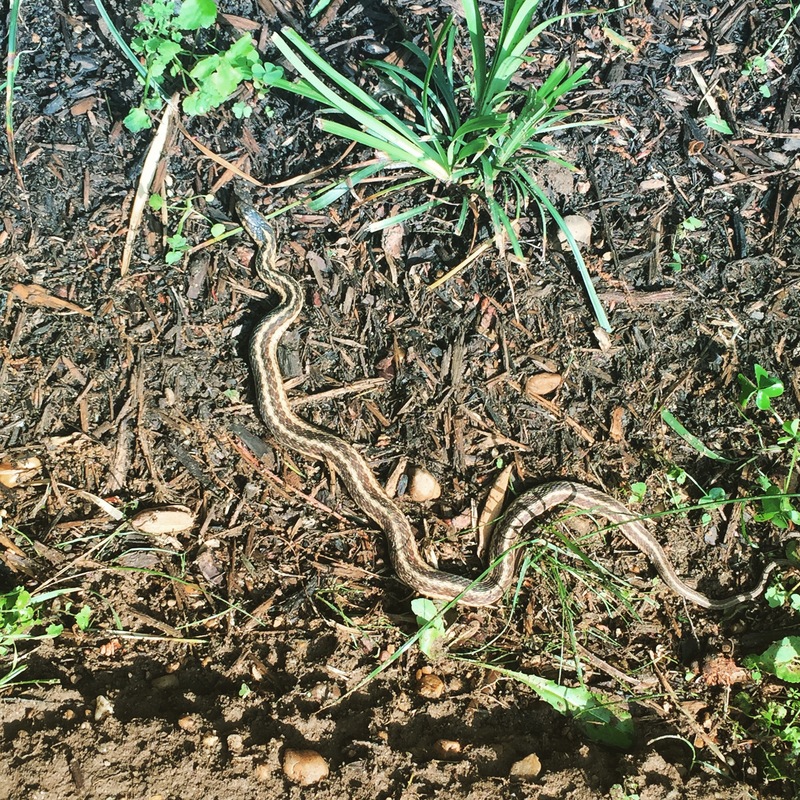 I spotted him right after a gullywasher of a rainstorm and Mr. Slithers was enjoying a bit of the sunshine peaking through. Sometimes I’m a bit dyslexic, mixing letters when I speak/write or transposing numbers. As a kid I said belldoor and some other last then first words. So as I changed my plans recently, it came out as a plans of change in my mind. I nixed the hospital volunteering gig, too much structure and requirements for the summer. And replaced that effort with becoming the co-coordinator for the community garden. I will spend more time on the community garden then required by the hospital however I set my own hours and tasks! And will be outside-another bonus. I have planted peas, lettuce (mesclun mix), radishes, red onions, and sweet onions. 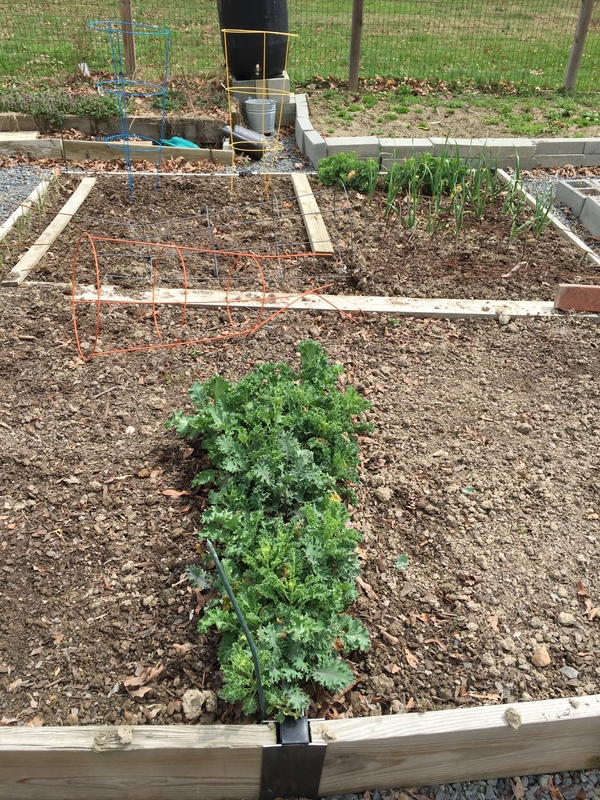 The kale wintered over nicely and the garlic planted last fall looks good also. I have seedlings of eggplant, a determinate tomato variety, hot peppers, tomatillas, broccoli and some herbs set outside to harden off. And I ordered some plants that should arrive soon. 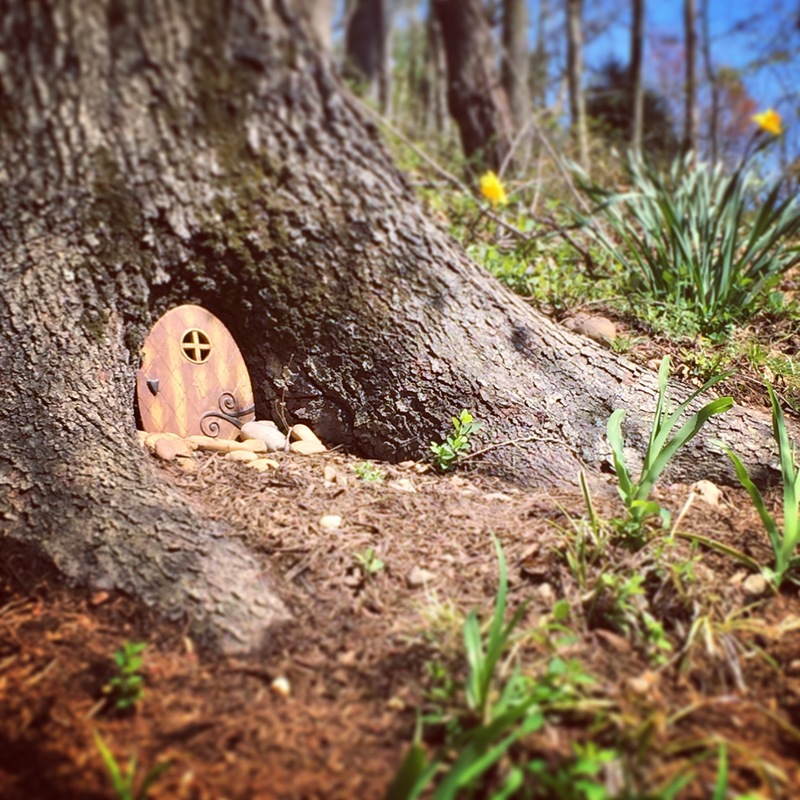 I have started on a fairy garden in my yard. Some will surely laugh at such, however I love the idea. Reminds me when I was a child and would make a small garden under a bush at the end of our porch, catching tree frogs to live in my tiny haven. As I grew older, I would sneak a smoke in the same space until the neighbor across the street ratted me out to my mom. I guess that was something to see-a smoking bush! So thankful I kicked that habit years ago. So 37 days into “retirement”, I decided not to call it retirement. I consider myself in between jobs at the moment without a clear idea what kind of work I want to pursue. As I ponder this next act, I am reading a lot of different things. Like this website Encore, Second acts for the greater good. And then this article in this mornings WA Post, How long do I have? and why one may not want to retire! I admit to being a bit bored which is probably normal as I went from a fast-paced, stressful environment to an extended vacation! So to keep busy, I “interviewed” for a volunteer position at the hospital. And looks like I will start that in May, every Wed for 4 hours. Over the last few weeks, I have been to the beach, to visit my mom and then to visit son at school. 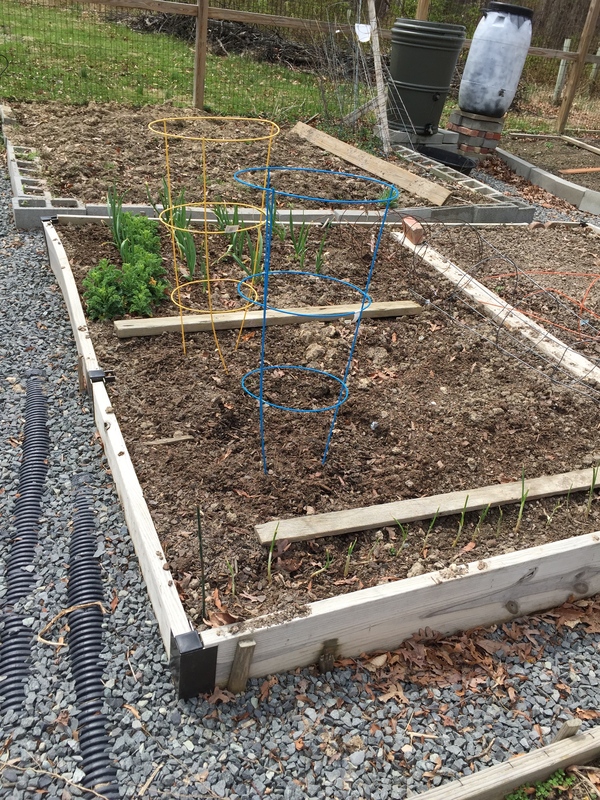 I have my community garden spot tilled and early spring stuff in the ground. I have seedlings sprouted and getting ready to set out. On this rainy day I intend to start cleaning and organizing. While visiting our son, we drove around Claytor Lake State Park. I think I would like to return this summer if for no other reason to swim out to this platform! We had a lovely, long snow yesterday, beautiful heavy wet flakes. 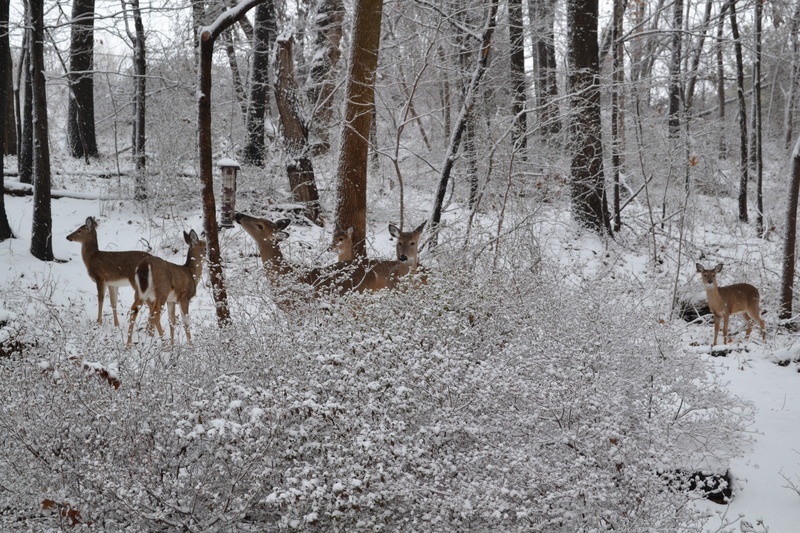 About mid-day, the ladies came through the backyard on their way up the hill to bed down for the duration of the storm I suppose. I guess they have a spot out of the wind, protected somewhat from the weather. During warmer months, I have seen spots where they bed down in the grass. We also saw our friendly fox, making his/her? rounds, trotting up through the woods following a similar path that the deer take. I tried to capture the fox on film but no such luck. We did eat at Hanks Oyster Bar the other night, and will definitely go back. I had 1/2 dozen Virginia oysters for a starter, followed by a pear and arugula salad and a crab cake, both items from the small plate menu. Hubby had the ceviche (yum! and a generous portion) and the seared scallops on cauliflower puree. The prices were a tad high though typical for Old Town. Lots of sounds today, the big ole north wind hitting on the house causing the furnace to kick on and the fire in the wood stove popping. Looking out the window, I see the shingles on the shed blowing up, looks like some have already blown off. I don’t think I will venture out much today! So I have 2 weeks left at work. Things have slowed down finally. I really only have 8 work days left. I go from very happy, almost giddy to incredibly sad. Jon Stewart announced his retirement from the Daily Show on the same day, I announced mine at work. I keep listening to Jon Stewart’s retirement announcement and it hits home. I loved the part where he talked about the show doesn’t deserve an even slightly restless host and how he loves the people, and what an honor and privilege it is to work there. His sentiments hit the nail on the head for me. I love the people I work with, I have been incredibly blessed with opportunities and I have been hooked on our mission for countless years. AND I DONT KNOW WHAT I AM GOING TO DO! Scary for me, who always planned her career goals in 1 and 5 year increments. So I have some decompressing, resting, and contemplating to do. My goals for the next 2 weeks are to be patient, stay in the moment, do more yoga, and don’t cry! I have looked through countless photos to put into a slide show for my retirement party. 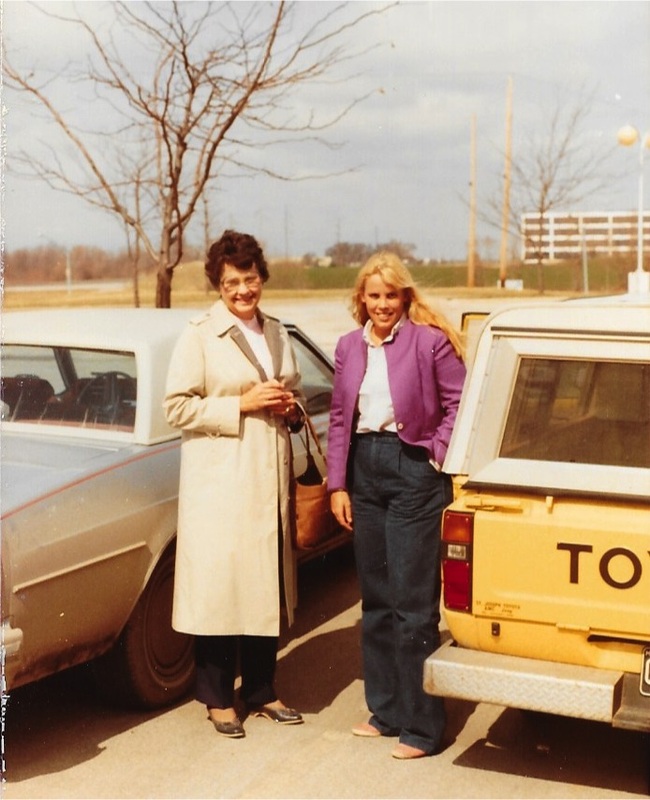 This one is from 1981, I was working in KC, met Mom and Carl at the Airport Hilton for some event. This one is from mid 1990s. I was home for a visit and helped Carl tend several of his hives. 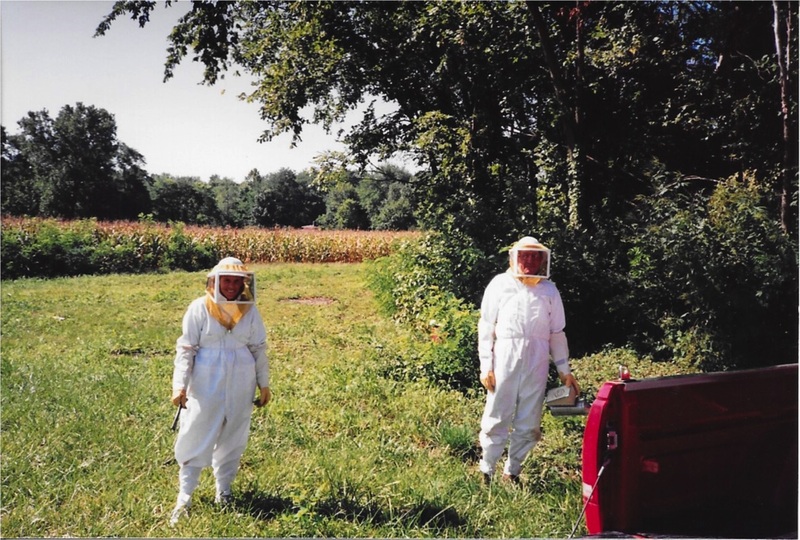 I liked to help him with the bees, so interesting and I never got stung though he did many times. I think I may acquire a hive this spring. My seedlings are up and looking good, all except the parsley. May have to re-plant that flat. 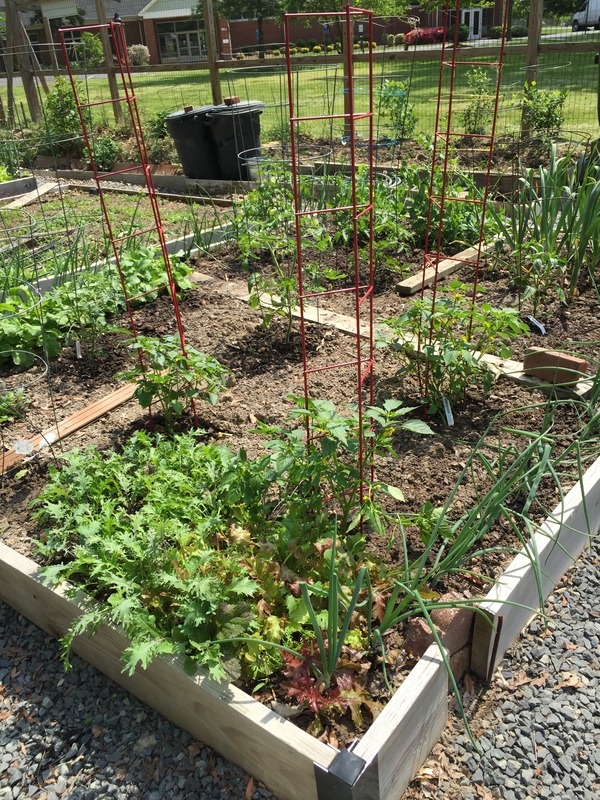 Turning our tiny backyard into an edible garden. 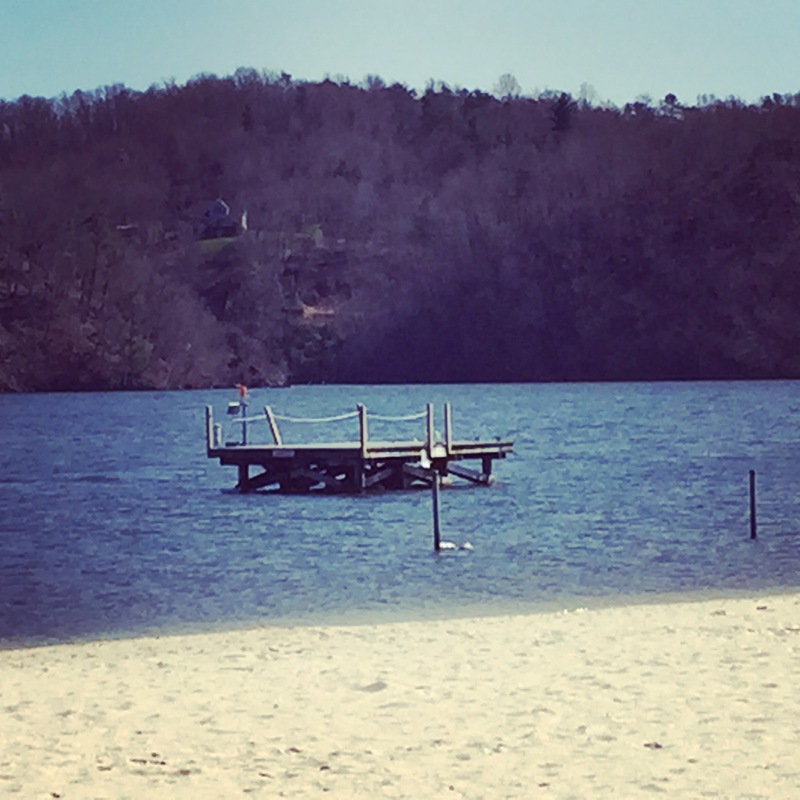 Sharing the little things in life, one blog at a time!